Princess Alexia of Greece and Denmark may not be a member of a reigning royal family now, but when she was born, she was heir to the throne of a kingdom. Even now, she's related to numerous reigning royals, so she needs plenty of jewels for grand gala occasions. 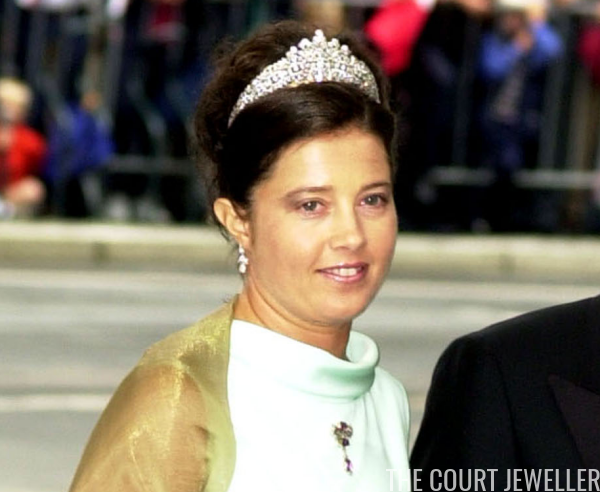 Today, we're looking at the diamond tiara from her collection. The tiara is a classic, all-diamond sparkler. The curving shape of the piece almost resembles a kokoshnik, but it rises to a distinctive peak at its center point. The lacy design is busy, featuring elipses and navettes punctuated by round stones, giving the piece an almost solid appearance from a distance. If you're going to have one tiara, as Alexia apparently does, this one is a decent choice. It pairs well with lots of different gemstones, and its design is generic enough that it won't clash with other styles of jewels -- it can work with both traditional and modern pieces. Alexia often wears the tiara with pieces set with diamonds, pearls, and rubies. Exactly how and when Alexia acquired this diamond tiara is a matter of debate. Some assume that her mother, Queen Anne-Marie of Greece, followed family tradition and gave Alexia the tiara on her eighteenth birthday. She's had the piece for years, so that theory is certainly possible. We also don't know when the tiara was made or who made it. My guess would be that it's a recent creation, but that's only a guess, based on the design and setting of the stones. Alexia has worn the tiara at some of the biggest family celebrations she's attended, including the wedding of her first cousin, Crown Prince Frederik of Denmark, and her second cousin, Crown Princess Victoria of Sweden. She's also worn it for other family weddings and milestone events, including birthday celebrations for her aunt, Queen Margrethe II of Denmark. But she's also generously loaned the tiara to her younger sister, Princess Theodora, on at least one occasion. Above, Theodora wears the tiara at the wedding of another cousin, Princess Madeleine of Sweden, in 2013. 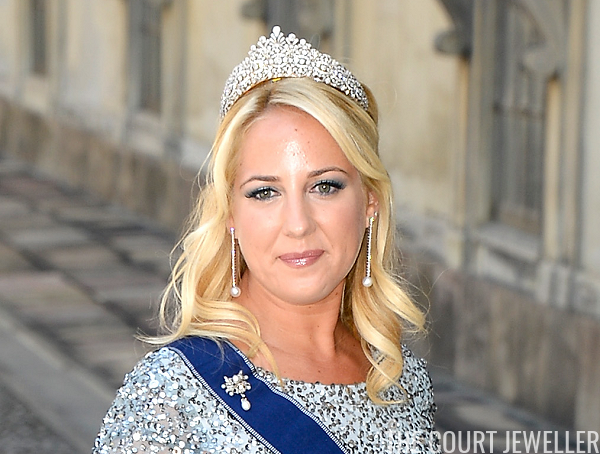 Unlike the more traditional, floral earrings that Alexia usually pairs with the tiara, Theodora chose a pair of modern diamond and pearl drop earrings for her appearance in the sparkler.